In 1973, Italian manufacturer Lancia shocked the world at large with the dramatic wedge-shaped Stratos. The looked to have been grabbed straight from the set of a futuristic sci-fi adventure, but was in fact the first ever machine to be a purpose-built rally car. Its competitors were all based on mundane family saloons, which left the incredibly compact, light, nimble, well balanced and powerful Lancia to take a grand total of 18 World Rally victories and three World Rally Championships (1974, 1975, 1976). Parent company Fiat put a stop to the Stratos’s reign of terror to promote its 131 Mirafiori model instead. In rallying the Stratos was virtually unbeatable. Right in the middle of the rally weapon’s winning streak, Lancia made plans to adapt the car to the new Group 5 Special Production Car GT-regulations taking effect in 1976. This new category was intended to free up technical limitations on production-derived GT-racers, setting the stage for an era of widebody turbocharged insanity. Very little was specified in the Group 5 rulebook. Manufacturers wishing to enter would need to build a vehicle homologated for Groups 1-4 first, before being to able to derive a more extreme Group 5 evolution from it. On the technical side, only the bonnet, roof, doors and rail panel were to be left unmodified, and the car’s body width was to be left completely stock as well. Apart from a class structure based on displacement, the rest of the rules were almost completely free to interpretation. Group 5 eventually became a home for some truly maniacal machinery. Lancia knew the 2.4L Ferrari Dino V6 was nowhere near powerful enough to be competitive on Europe’s circuits against machines like the Ferrari 512BB/LM, Porsche 935 and BMW 3.5 CSL. With this in mind the 270 horsepower engine was bestowed with a holy gift. In unmistakable late-1970’s fashion, the little V6 was fitted with a massive single KKK turbocharger. Power shot up into the 400 horsepower region, but Lancia still had much work to do. Turbocharging was was still a very new and unpredictable technology, meaning the Italians would have to take their sweet time to perfect their new turbocharged ánd intercooled creation. For 1974, the Stratos gained access to the dark art of turbocharging. As soon as reliability was deemed acceptable, the turbo block found its way into a modified Group 4 road racer. Lancia had been racing the naturally aspirated Stratos as a 3 liter class prototype at road races like the Targa Florio, Tour de France and Giro Automobilistico d’Itala since 1973, and decided one of these chassis would be the ideal testbed for the new turbo powerplant. The turbo car was then entered into the 1974 Giro d’Italia, a 1600 kilometer (1000 mile) road rally held around Turin. Uniquely, the event combined regularity tests on open roads with genuine rally stages and even bouts of circuit racing. Frenchman Jean-Claude Andruet and his navigator Michèle “Biche” Espinos were given the task of defending Lancia’s honor. The pair did not disappoint, as they won they Giro outright on the Stratos Turbo’s first outing. As one of two Group 5 competitors, their win was made extra sweet by defeating the experimental Abarth SE 030. The turbocharged Ferrari V6 was first used in a mildly modified Group 4 chassis for the 1974 Giro d'Italia. The following year, the car made a second appearance at the Giro. Five time World Rally winner Sandro Munari (ITA) took over from Andruet, joined by navigator Mario Manucci. A flashy new Alitalia livery gave the car great look. Sadly this didn’t translate in results, as Munari/Manucci finished a distant 6th. Fiat-Abarth’s SE 031 took the win instead. By now, the ambitious Ferrari turbo V6 had proven itself beyond reasonable doubt. Reliability was very impressive for Lancia’s first forced induction design, especially looking at the results of the 1975 Giro d’Italia. Of the three Stratos’ entered, only the turbo model managed to finish. The car’s excellent record motivated Lancia to try and extract even more power from the engine, and to adapt the car fully to Group 5 requirements. The rear of the car was partially open to help keep the mad turbo engine cool. A much larger nosecone and longer tail were fitted, along with gigantic wheel arch extensions, sideskirts and a sizable rear wing. In addition, the car’s characteristic pop-u headlights were deleted to make the car more slippery. Aside from the aerodynamic improvements, Lancia did exactly nothing to improve straight line stability. The obvious move would have been to increase the car’s perilously short wheelbase , but the Italians opted to turn up the boost instead. As much as 560 horsepower was now on tap, easily a class-leading figure. A beefed-up five-speed manual transmission ensured the power reached the rear wheels. For improved weight distribution, the fuel tanks were moved to the door sills. Race ready the car weighed 938 kg (2068 lbs), 58 kilo’s (127 lbs) more than the Group 4 rally car. 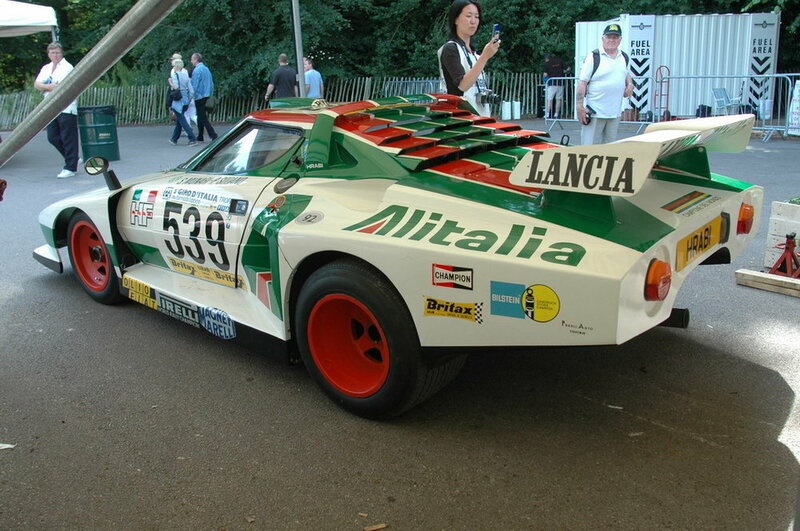 In the end Lancia was left with a car that shared virtually no parts with the regular rally Stratos. The car's famous pop-up headlights were deleted to improve aerodynamics. A single HF Turbo was completed in time for the start of the inaugural season of Group 5 competition, the 1976 World Championship for Makes. Once again, the car displayed Marlboro sponsorship, and was subject to another driver change. Lancia’s rally drivers were not in the mood for circuit racing, so the company drafted March F1 driver Vittorio “The Monza Gorilla” Brambilla and Alfa Romeo sportscar racer Carlo Facetti, who’s tuning business also helped develop the turbo engine. The strong driver pairing could do little to save the first race at Mugello however, as the Stratos overheated during qualifying. The heat escalated to a fire and the car was forced out of the race without even setting a time. The #25 Stratos HF Turbo burning to a crisp, Zeltweg 1976. The next round at Vallelunga started on a more positive note. Brambilla/Facetti qualified a fine 3rd. The duo was just a second behind the Kremer Porsche 935 of Bob Wollek (FRA)/ Hans Heyer (GER) and four three removed from the pole-sitting Martini Racing 935 of Jacky Ickx (BEL) / Jochen Mass (GER). Sadly their race ended prematurely once more despite their competitive position, as the gearbox failed early on. An entry into the Silverstone 6 Hours resulted in a no-show from the Italian squad, and they would not return until round 5 at the glorious Österreichring for the 6 Hours of Zeltweg. There the car again overheated and caught fire during qualifying, but this time the flames could not be stifled. Tragically, the solitary Stratos HF Turbo burned down to the ground. Both Turbo's competing at a circuit leg of the 1976 Giro Automobilistico d'Italia. Despite the major setback of losing a car, Lancia pressed on to complete two more Turbo cars in time for the 1976 Giro Automobilistico d’Italia. Carlo Facetti was joined by navigator Piero Sodano in #598, with the #599 sister car polited by Raffaele Pinto and Arnaldo Bernacchini. The Stratos Turbo at the 1976 Giro d'Italia. Pinto’s car slid off the road and into retirement on the early stages, leaving Facetti to fend off the Porsche’s for the lead. In a stark contrast to the disastrous run at the World Championship for Makes, the Group 5 Lancia seemed to be a perfect fit for the Giro road rally. Raffaele Pinto and Arnaldo Bernacchini on a night stage, 1976 Giro Automobilistico d'Italia. The car’s roots as a rally machine combined with the added power and downforce made it a force to be reckoned with. Facetti put in a fantastic drive, and finished 6 minutes and 38 seconds ahead of the Porsche Carrera 3.0 RSR of Franco Bernabei / Borgia and the 934 of Leonardo Pittoni and Maurizia Baresi. Finally the Group 5 evolution of the turbocharged Lancia had delivered on its promise. The stunning Alitalia livery made a return in 1977. 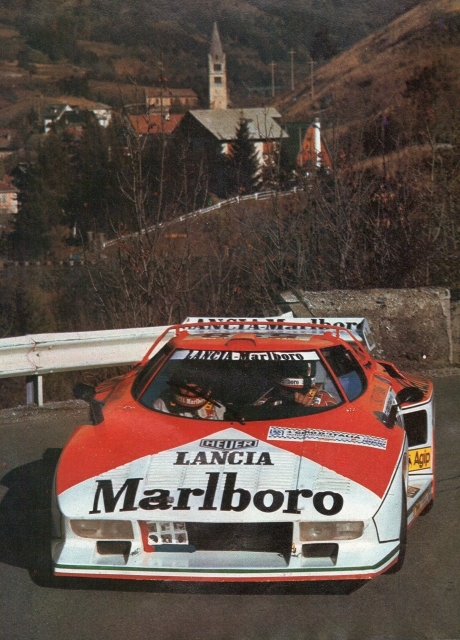 For 1977 the Stratos Turbo program was wound down significantly. Despite this the car’s aerodynamics were improved further, with an ever larger rear section and different rear wing added to the fray. However, the car’s lack of success on the European circuits had led Lancia to switch to the four-cylinder Beta Montecarlo platform in search of a competent Group 5 monster. 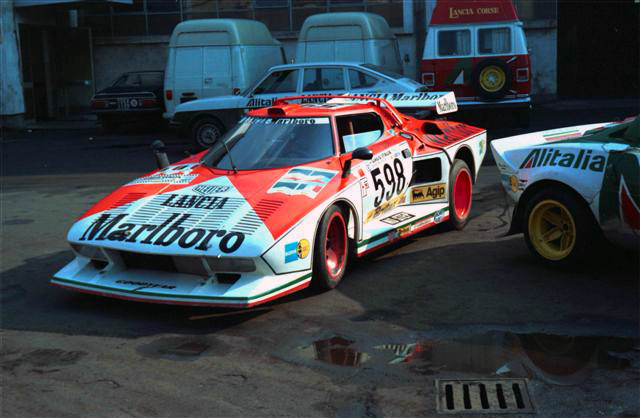 With its days numbered, the Group 5 Stratos was allowed to compete one more time. Back in the hands of Sandro Munari and again painted in the gorgeous Alitalia livery, the car made one final appearance at the Giro in 1977. Unfortunately the race ended in disappointment, as the engine gave up in the early stages. The tail section of the 1977 car was even longer and wider. After the car’s appearance at the Giro and the death of chief Stratos project leader Mike Parkes, the car was officially retired and shipped off to Japan. It was set to appear in the Silhouette Formula support race to the Fuji Grand Champion Series at Fuji Speedway. Sadly the race was never contested, and the sole remaining Stratos HF Turbo fell into the hands of collector Yoshiho Matsuda, who promptly added it to his vast array of exotic machinery. For the better part of twenty years the car remained at Matsuda’s museum, until it was bought by fellow collector Christian Hrabalec in 2000. 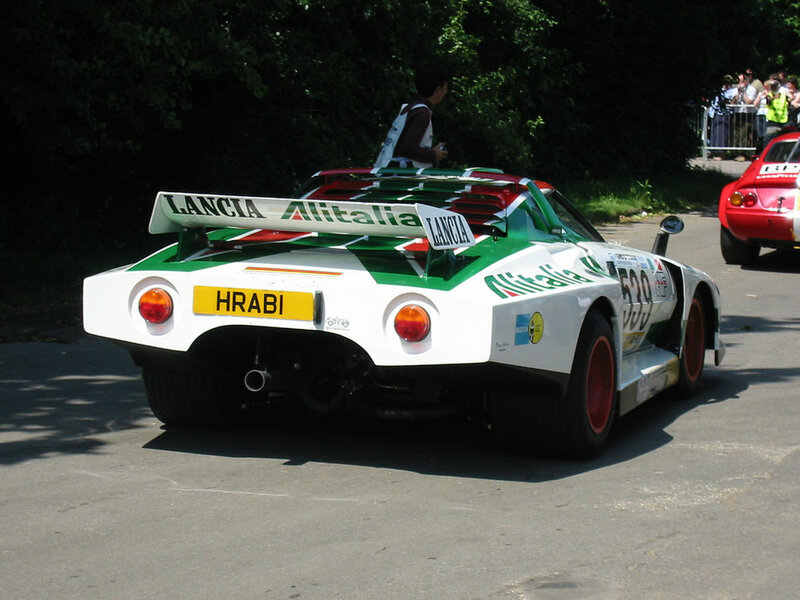 Hrabalec was a true Stratos fanatic, and would later design the retro-look Fenomenon Stratos developed by Prodrive. The Turbo has been with him ever since, and even appeared at the 2005 Goodwood Festival of Speed. The Lancia Stratos HF Turbo Group 5 silhouette represented Lancia’s first steps into the world of high-powered endurance racing. Wishing to spread its chances, the company developed a deranged turbocharged variant of the beloved Dino V6. After testing it in a relatively untouched car, the Italians went completely berserk. With over 500 horsepower on tap, massive wings and bodywork extensions, the blown Stratos was a sight to behold. Sadly the car never performed as good as Lancia had hoped on the track, preferring to stick closer to its rallying roots in the Giro Automobilistico d’Italia. The car managed to win the grueling twice in both narrowbody and widebody form, but in the end it just wasn’t good enough. In actual fact, the Stratos didn’t want to be a racing car. It was born for the tight twisty stages of the WRC, and simply refused to engage in trivial things like driving in circles. Realizing their mistake Lancia abandoned the twitchy machine in favor of the purpose-built Beta Montecarlo Turbo in 1979, and went on to much greater successes. But none of that would have been possible without the pioneering work of the groundbreaking Stratos Turbo.